this is not correct... I dont know what you have done... you should not have the object here. There is one thing about this object: Is it possible to make it so we can control the length when the patch is live? Like the ctrl/i object for example? Right now you cant do that. I am thinking you have taken code from the const/i object and not the ctrl/i object? I plan to make a v.2, with dynamic length and offset controls. Nice Was just messing around with it a bit. I managed to get the counter from the ctrl/i embedded into your object and this one you can edit live and also assign to preset. BUT I have not managed to get the new counter working yet. It is embedded into the object but not functioning. The valuebox you used is an attribute, probably from const/i and the one I've put into it, is a parameter. Question is how do you I get the object to use the parameter preferences instead of the attribute preferences? Have tried a few things in blind but none worked yet. One other thing I have been trying to make is a ctrl/i which is midi cc assignable. But that needs to be edited in Java and is a bit more complicated from what I understand. But that would be REALLY awesome, also for this object. Yeah, I'm getting a bit frustrated it's doesn't seem to be possible to create an automatable rotary control with defined Min/Max/Default values. It makes no sense from a UI point of view to have step-length control that goes from 0 to 63, in increments of 0.5. Seems like a basic to me to be able to define step-size, minimum, maximum and default alues for a control. I realise this means pre-scaling of values, but this should be done transparently by the compiler, in my opinion. Maybe this particular scenario is a special case, but if it is, I'd have thought it's a common-enough scenario (i.e. defining controls for step-sequencer-type object) that it's worth some modification of the way controls can be defined to accommodate it. 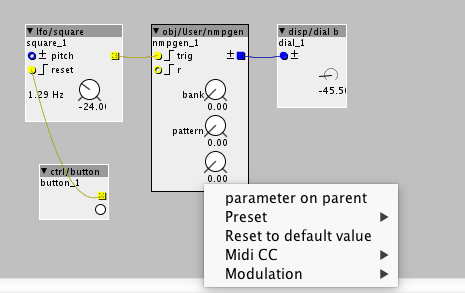 Not being able to modulate or assign the Length parameter to a MIDI CC isn't ideal, though. If you re-synch your libraries, you should get a new version with Length as Param, rather than Attribute. I just updated it and uploaded the new version to the Contrib repo. Hm just resynced and restarted Axoloti a few times, but still looks the same. No change here. I was working on nmpgen2.axo, in a private library. Have now updated the one in the Contrib repo. Try syncing again. ALso I notice the counter is a bit off. For example when the length is set to 3 it is actually 5 in length. Anyway, small issue. Oops. Should be fixed now. Try resyncing (again, sorry....). Just out of curiosity, how did you fix the length issue? That was what you also fixed right? Hmmm. I am not sure it was fixed. Now the pattern start from 2 and up. Can not select below 2. I purposely set a minimum pattern length of 2. I've changed it to 1, now. I've also uploaded another version ('nmpgen2.axo'), with max 32 steps, but length and offset as knobs, so can be automated and controlled by CC. The downside is the numbers on the dial aren't accurate (the actual pattern length and offset are half the values displayed, rounded to nearest whole number). 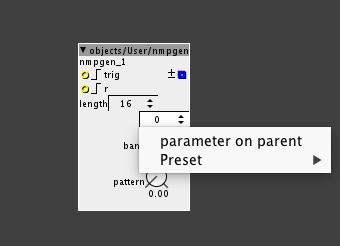 A version of nmpgen.axo, 32-steps max now, but with realtime-controllable Length parameter and added Offset control, to rotate the pattern. 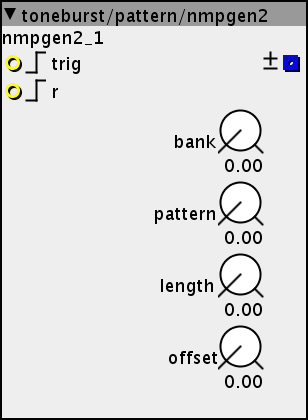 A version of nmpgen2.axo, with added Trigger pattern output (Boolean pulse). 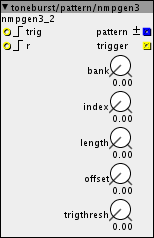 'trigthresh' parameter controls density of triggers. 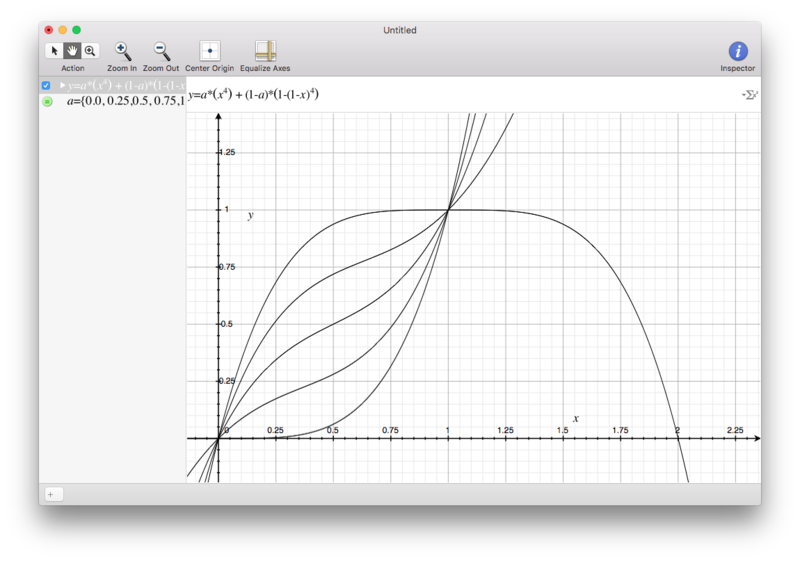 K-Rate interpolation of positive integer input with adjustable curve from logarithmic to exponential. Use to pre-process control values, or alter the response of envelopes. 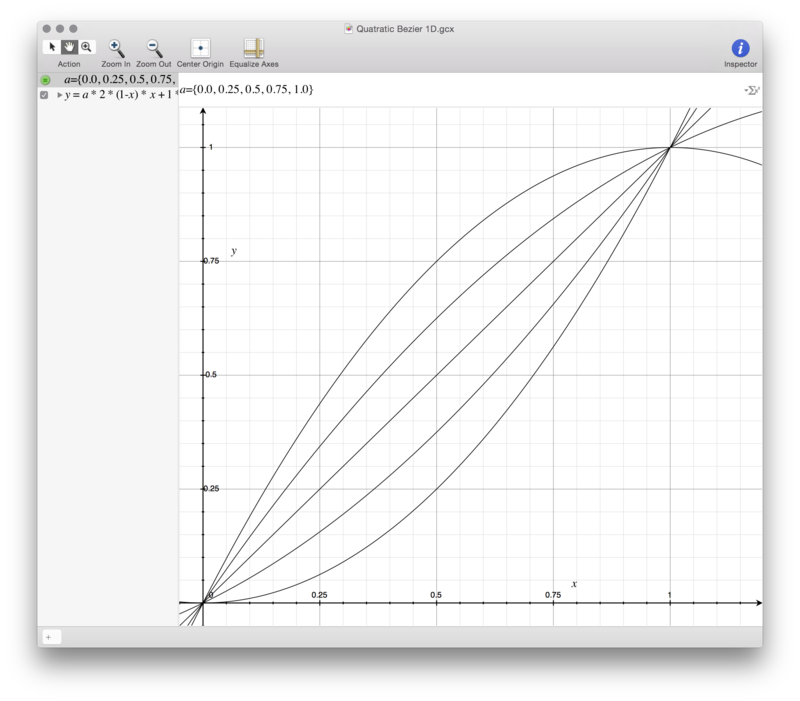 Thanks to @johannes for interpolation algorithm. K-Rate interpolation of positive integer input with adjustable 1D single-point (Quadratic) Bezier curve from logarithmic-like to exponential-like. Similar to toneburst/math/interpolation-pow4.